Noted and done. Thank you Cher. Signed. I can't understand why anyone would want to do this. 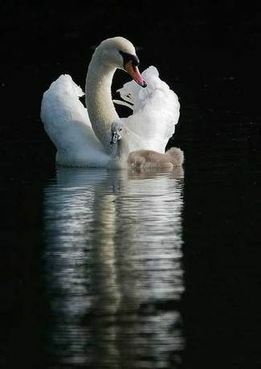 Thank you for signing the petition "Please sign to Stop The Killing of Mute Swans in Maryland!" Thank you Cher. This really is the pits. Mankind is the most 'invasive' species on this planet. Boy that change.org site doesn't like me - I tried to sign in and it told me that my email doesn't exist AND it also told me that it is also being used by another account?!?! Very odd. I guess it's the snail mail approach for me. Thanks! The Maryland Department of Natural Resources (DNR) insists on wiping out the Mute swans, The Baltimore Sun now reports. In what many believe will be the final word in a long fight, Secretary of Natural Resources John Griffin on Monday (8 June 2009) accepted the report of a hunter-dominated task force on the swans, saying that his staff is �unfortunately compelled� to continue population control efforts on the fewer than 500 birds still living on the Chesapeake Bay and its tributaries. That means shooting adults or snapping their necks, and shaking eggs to kill the embryos. Defenders of Wildlife and the Maryland Ornithological Society back the killing of mute swans. Some animal-protection groups support hazing the birds to wreck their eggs. Why? Of the many hundreds of thousands of birds living at the Bay, the community of mute swans adds up to a mere 500. Just six years ago, there were approximately 4,000 but Maryland Department of Natural Resources is systematically killing them to eradicate them from Chesapeake Bay. Mute swans are deemed �invasive� by the DNR � a loophole from federal Migratory Bird Treaty Act protections � but they are naturalized members of the biocommunity. The demise of aquatic vegetation is mainly caused by sewage treatment plants, runoffs from animal agribusinesses, construction and road-building. All of these factors degrade water quality, making the Bay water turbid and blocking sunlight that gives underwater vegetation the energy it needs to grow. Ask the Office of Governor Martin O�Malley to intervene now to stop the killing off of Maryland�s Mute swans. Also contact the Maryland Department of Natural Resources (DNR): John R Griffin, Secretary; and Jonathan McKnight, Associate Director. Let them know killing Mute swans is no answer to the Bay�s problems. Tell them to stop the killing now. But you can still take action as listed above.